A good Winter hike but lacking in sun (except in the 2002 burn zone). Trail built in 1981. The original trail was on the other side of the river. The East end to Pup Creek is more interesting but walks a few powerline clearings. The fire on the west end has allowed more light to reach the forest floor and is creating more brush than there was before. For several years this segment will have more trees and debris down on the trail than usual. The west end is subject to falling trees during periods of wind. Lots of highway noise on weekends during the summer; noise muted by high water noise in the Winter and Spring. Very pleasant during the week. Several nice camp sites. Wilderness restrictions apply to the east end of this trail, Pup Creek to Indian Henry. Much of this trail is cut into steep slopes. It is often a narrow trail with precipitous drop offs in places. Important to be sure footed and watch ones step. Treacherous when icy. If we have low snow, it will tend towards the Indian Henry end. Resist leaving valuables in the car. Trail fee applies at the Fish Creek Trailhead. Poison oak is thriving at the switchbacks in the burn area and in the power line clearings between Pup Creek and The Narrows. 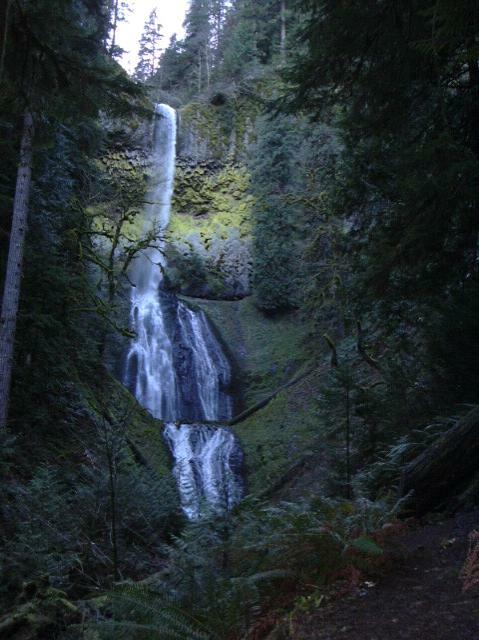 Pup Creek Falls is quite beautiful, especially in the Spring. Might be best to start from the Fish Creek end to see the falls. This will prevent you from needing to cross Pup and Cat Creeks which have abundant flows during the rainy seasons. Cat Creek can experience high debris flow which may inundate the stepping stones. Look for the side trail to the Falls just above the west bank of Pup Creek when heading upstream.